Jamila Arts, established in 2004 by Mr. Rashid Akhtar, a mastermind person for different kind of handmade rugs & carpets adopted by his ex-father and personal experience of different process. Also we have acquired rich industrial expertise which assists us in developing products as per the specific requirements of our esteemed clients. To carry out different process of product manufacture such as yarn spinning, dyeing, weaving and finishing. Our trade affiliation with Carpet Export Promotion Council ensures our credibility for which we cater in global arena for developing our range in highest quality standard. We have an excellent goal of hardworking and dedicated professionals comprising of artisans, craftsmen, weavers and designers as well as sales man. 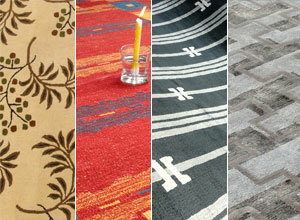 It is due to their hard work and persistent efforts that we are able to offer an enthralling collection of carpets. We ensure flawless supply of our range to all our clients so that they do not face any trouble from our end. Our creative team strives to understand the customer demands very well, so that they are able to achieve complete consumer satisfaction. They work in close coordination to provide customized solutions and bring innovations in terms of pattern and style in the existing product range. Jamila Arts constantly focuses on quality and believes that quality is the key to achieving complete customer satisfaction. To ensure the quality of products, the company follows stringent quality checks right from initial stage to the final stage of production. The exclusive carpets and rugs are valued for their exquisite and intricate craftsmanship. The Company has an in-house designing unit equipped with the required tools. The team of skilled manpower always works with utmost dedication to perform at its best. The craftsmen take care of the detailed work, the designs and color patterns to offer innovative products each time. The products have won the trust and confidence of its clients from all across the world. The unwavering commitment to qualitative products and services has secured optimum customer satisfaction. We have proved our worth by offering excellent quality home décor carpets and customized solutions, along with competitive price range which has enabled us to secure the confidence of our clients. We intend to achieve more laurels with the time passage by administering complete customer satisfaction in lieu of our services.